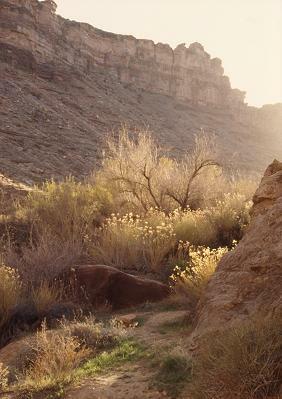 This is the beginning of the trail that led up the talus slope to a low point in the cliffside. 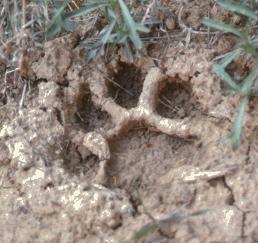 We saw relatively little wildlife, but I did find this paw print, which looked to be the right size for a mountain lion. 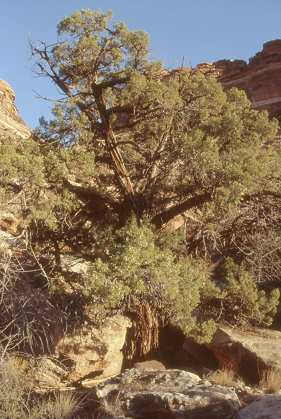 This is a pine tree on the cliff trail. 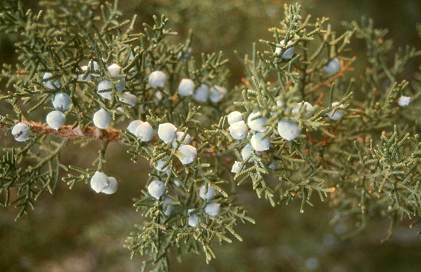 Some berries on a pine tree near the campsite. I took this picture just after dusk from our campsite. You can see a thin crescent moon just setting; it was just past new. 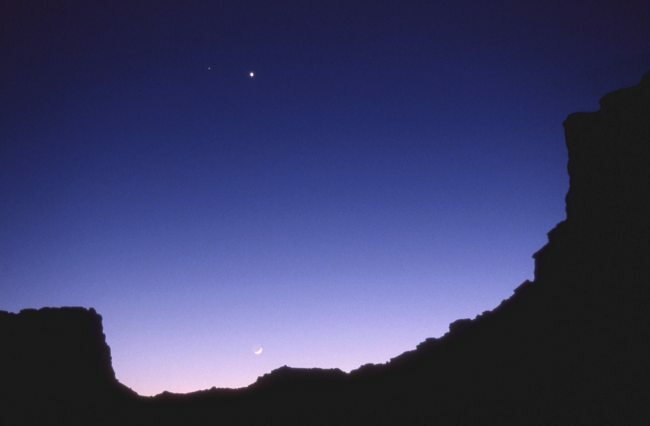 Venus (the brightest "star") and Saturn are higher up. The new moon occurred during the trip, resulting in very dark skies. Being so far from city lights, the stars and Milky Way were dramatic. This was the first time (and so far the only time) that I have seen the zodiacal light. The zodiacal light is sunlight that is faintly reflected from dust orbiting the sun between the earth and the sun. Once it got completely dark, with no vestige of dusk remaining on the horizon, there was still a wide band of faint light extending about 60 degrees above the horizon and about 40 degrees wide. The light was very diffuse and pale, and looked about as bright as light from the Milky Way. As the evening progressed, the band of zodiacal light "set" in the west like any other celestial object. I saw meteors every night, including one when I was stargazing through binoculars. When I went to bed, since I didn't use a tent, I could just lay there and gaze up into the sky. It was hard to close my eyes, the view was so grand. This is our last day on the river, so I'll take this opportunity to present a few more general comments. Drinking water is so very important, even in the cool springtime. Although you can drink the river water, it requires proper treatment and is basically like drinking watery mud (ugh!). Therefore, you need to bring adequate supplies of drinking water with you, generally recommended as one gallon per person per day, minimum. This is how we handled drinking water: John brought three six-gallon plastic jerry jugs from California which we filled up in Moab and lashed to the raft. In Moab, we bought two one-gallon jugs and 14 1.5-liter sport bottles. The one-gallon jugs were not very useful, since they were difficult to store in the kayaks and tended to crack and leak. The sport bottles were a very convenient size and could be stored anywhere, however we didn't really need to buy that many (we wound up using only a few and refilling them from the jerry jugs). We also brought a conventional backpacker's water filter and chlorine bleach for water treatment, although these items were for emergency use only. We used river water for washing dishes and washing ourselves; we used drinking water for cooking and brushing our teeth. Our total water supply was (3 x 6 gallons) + (2 x 1 gallon) + (14 x 1.5 liter) = about 25.5 gallons. Our total water requirements were (6 days) x (4 people) x (1 gallon/day/person) = 24 gallons. So we had adequate water. Surprisingly, we used only 11 gallons, which was less than half of our water! It's my opinion that we weren't drinking enough water. The temperatures were comfortable enough so there was little if any sweating. However, due to the very dry climate, you lost lots of moisture anyway, so I think we were slowly but surely becoming dehydrated. By the way, do you know how to tell if you're becoming dehydrated? Every day, you should have to pee a few times. If you go a whole day and only pee a little bit or not at all, you are becoming dehydrated  drink more water until you start peeing regularly! Since we were provisioned like a car-camping trip, we ate well every day. Here are some dinner menu details: 1st night: steaks, peas, corn; 2nd night: chicken, vegetables; 3rd night: hamburgers, beans; 4th night: pasta, chili, spinach; 5th night: salmon salad, beans, cornbread (baked in a camp oven, no less!). We had soup nearly every night. Breakfasts were coffee, pancakes, eggs, toast, cereal, etc. Lunches were varied, basically whatever we could find. We had bread, luncheon meats, cheese, peanut butter and jelly, fruit, snacks, cereal, power bars, condiments, etc. Ben brought three cases of beer (he liked his beer). We used John's melamine boat dishes and lexan "silverware", which worked well. If you bring a gas lantern, bring a carrying case and extra mantles  we wound up replacing three mantles. It would have been nice to have some kind of table. We used the tops of the ice chest and dry storage bin, but the problem is that you need to OPEN those things so every time, you have to clear the "table". We used the plastic tarp as our kitchen workspace, but being low to the ground, sand and dust would get blown into the food and on to the dishes. River scenery. You are looking at the confluence, where the Green River joins the Colorado River. We are still on the Green River, looking down the last 1/4 mile. 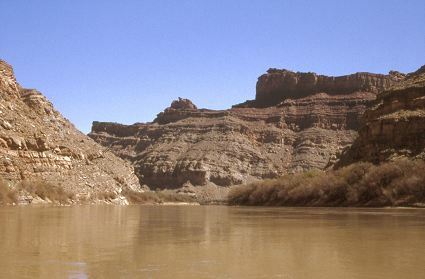 The Colorado River passes from left to right, just in front of the cliffs in the background. The combined rivers exit to the right, around the corner from the cliff in the right foreground. We didn't have far to paddle today, just from our campsite at mile 7.0 down to the confluence at mile 0.0. This was deliberate, since we wanted to arrive at our pick-up location in plenty of time for the scheduled jetboat ride back to Moab (there is no road access to the confluence). 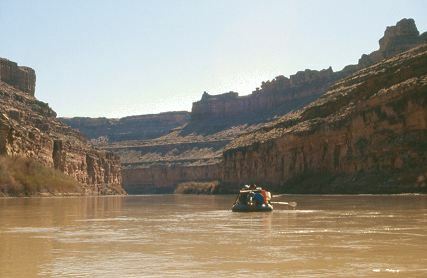 I was surprised how ambiguous the confluence was  if I didn't have a map or foreknowledge, I would have had trouble telling which way the Colorado River went. There was no visible slope to the river, and due to a gigantic eddy, it was very hard to tell which way the current went. But, I did have a map and foreknowledge, so I knew to "hang a right". The river trip concludes on the next page.